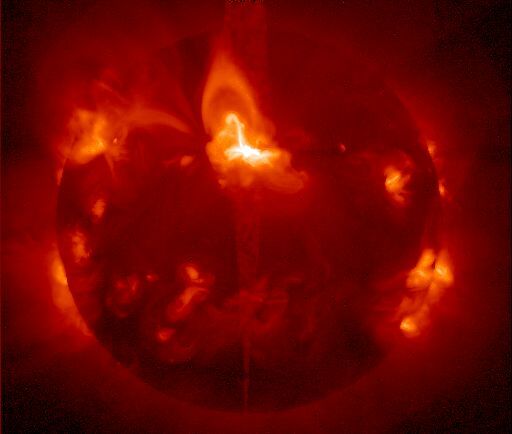 Explanation: Space Weather forcasters are predicting major storm conditions over the next few days as the active Sun has produced at least three strong flares and a large coronal mass ejection (CME) since Tuesday, June 6th. This recent false color X-ray image of the Sun shows the active region generating the explosive events, here the Sun's most intense source of X-rays, as the dominant bright area just above center. X-ray hot plasma suspended in looping magnetic fields arcs above this region, cataloged as AR9026. AR9026 appears as a large group of sunspots in visible light images. The three intense flares were all X-class events, the most severe class of solar flares based on X-ray flux measurements by the earth-orbiting GOES satellites. Energetic particles from the CME, associated with the second X-class flare, were directed toward planet Earth and could produce geomagnetic storms as early as today. Possible effects range from increased auroral displays to disruptions of satellite and communications systems and electrical power grids. But wait ... there's more! In the coming days AR9026, carried slowly across the Sun (from left to right) by solar rotation, is likely to produce even more solar flares.